The invisibelt story is a personal one. It started when founder Kathy Kramer bought a pair of pants that were just a little too big in the waist. It wasn’t significant enough for her to dish out $25 for a nip at the tailor, but they weren’t perfect either. What was a style-conscious girl to do? Belts created a bulky eye sore when trying to achieve a seamless look with fitted tops, and ribbons tied around her waist slid out of place. There was a void in the market for a flat, undetectable belt, and Kramer was determined to fill it. Voila, the invisibelt was born, helping solve a problem that millions of women – of all shapes, sizes and ages – have. As an added plus, she discovered that the invisibelt provides an instant slimming effect. Kramer, a veteran Beauty Director for leading women’s magazines, knew she was on to something special when top publicists and editors flipped for her invention. Fashion’s hot new, problem-solving accessory falls into the category of “why didn’t I think of that?”. 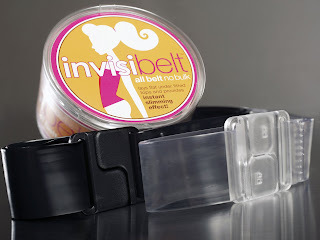 The invisibelt is a smooth, clear or colored plastic belt that is virtually undetectable. • Eliminates the unsightly bulge caused from bulky belt buckles. • Gives the support of a belt with a flat, clear and smooth finish. • Provides an instant slimming effect. no trace of a belt buckle detected. the average woman. Larger size belt fits up to 4x. • Available in NAKED (clear) and NOIR (black). lower rise pants, without the problematic belt buckle bulge. It’s also ideal for those pants (especially jeans) which start out snug and stretch out over the course of a day. A bra-like adjuster makes it a cinch to adjust to your size. Two lucky winners will win an invisibelt! All you have to do is go to the site, have a look around, and tell me in the form below which color you would choose. Remember to stop by Moody Mama Says and Everyday Baby Steps and enter their giveaways, then come back here and leave me a comment on which ones you entered! And thanks for this giveaway! I would LOVE this thing! My pants always stick out like they do in the one pic on their site and I HATE that! giveaways.. :) very cool event! !